Being able to improve observation skills begins with actually taking the time to look. We all love the Heart emoji, but lets free it from its smartphone home and see where it appears in natural form. The humble Celandine has always been my favourite. The simple yellow 8 petalled flowers that spring up from a cluster of vivid green heart shaped foliage. The Cyclamen is similar with vein patterns against against the dark heart shape leaves. A type of Oxalis, the Triangularis has always been one of my favourites. With heart shapes in both its flowers and leaves the Flamingo Lily is a brash statement of hearts in nature. The characteristic heart shape boasts the popular red colour too, but don’t be fooled, despite its emoji like appearance it can be poisonous. Its name always puts me off slightly (elsewhere known as ‘Lady in a bath’ ) Bleeding Hearts are popular in cottage gardens where a row of heart shape flower buds hang from long flower stalk like bells. If you ever dig for cockles at the tide line, check out the heart outline created by its bilateral symmetry. We don’t often look at shells from this angle but here you can clearly see the heart shape outline and also the curves of the spiral forms that mirror each other. There are many varieties of Hosta which display heart shape leaves. Hosta are prized for the foliage as the flower spikes seem a little underwhelming. It’s the foliage everyone wants in their gardens and so many small and large types available, who wouldn’t want smoky blue hearts in your border? Some see it as an invasive plant, but what is not to like about a profusion of hearts? 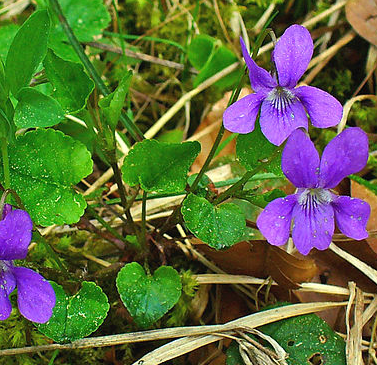 Wild violet or Viola displays plain green small heart shaped foliage. Heliotrope, often seen on waste ground at roadsides clearly displays the cardioid shape. I know what you’re thinking: “Some are not really heart shaped, you can’t even see it clearly!”. Organic forms are forever growing and changing during their lifetime and this observation is about seeing the qualities of what makes a heart shape. Often they will change and morph to become more pointed or more ‘Cardiod’ during their lifetime. Cardioid comes from the greek word for ‘heart’. ‘A heart shape curve, being the path of a point on the circle that rolls externally on another equal circle’. You can see in the illustrations above the variations of the cardioid heart curve. Some of those plants above don’t look so strange now. Can you see any near you?